The Vancouver Condo Buzz » LAUNCH! Burnaby SOLO District Phase 2 Release > Presales Burnaby ALTUS Condos at SOLO 2 from $200’s at Brentwood Burnaby’s Tallest Tower! LAUNCH! Burnaby SOLO District Phase 2 Release > Presales Burnaby ALTUS Condos at SOLO 2 from $200’s at Brentwood Burnaby’s Tallest Tower! Own a home in Burnaby’s tallest high-rise tower! Coming soon to the master planned SOLO District Burnaby Brentwood real estate project by Appia Development is SOLO 2 ALTUS Burnaby condo presales. Starting from the $200’s, you can own a brand new Burnaby ALTUS condo at SOLO District for a truly affordable price. Not only are you buying into a premier transit oriented established community, but you’ll also be taking advantage of amazing on-site amenities such as the ALTUS Club. Presales for ALTUS at SOLO District Phase 2 condo tower is coming May 2013, so please register for the latest details! The quality homes at SOLO 2 ALTUS Burnaby condo presales tower will be built to LEED Gold equivalent standards, which make your home within the top one per cent of green homes in the entire Lower Mainland. You can easily do your part in owning a brand new Burnaby condo and protecting the environment at the same time! In addition, the distinctive contemporary glass and concrete landmark tower will be designed by Chris Dikeakos Architects, and award winning firm. The SOLO 2 ALTUS Burnaby condo presales tower will also feature stylish interior design by award winning Cristina Oberti Interior Design group and will include 2 interior design palettes called Noce and Grigio. Being Burnaby’s tallest tower also gives you certain perks like beautiful panoramic views overlooking the majestic North Shore mountain ranges, Downtown Vancouver’s skyline and well beyond. All presales Burnaby ALTUS condos at SOLO District 2 will also feature central air conditioning which gives you year round comfort. All homes also come with TELUS Future Friendly fibre optics package and a sleuth of amazing five star amenities (described below) including the SOLO 2 Burnaby ALTUS CLUB 55 amenities. Home owners at the ALTUS Burnaby SOLO District Phase 2 tower will enjoy amazing perks and on site amenities that will remind you of a five star resort. 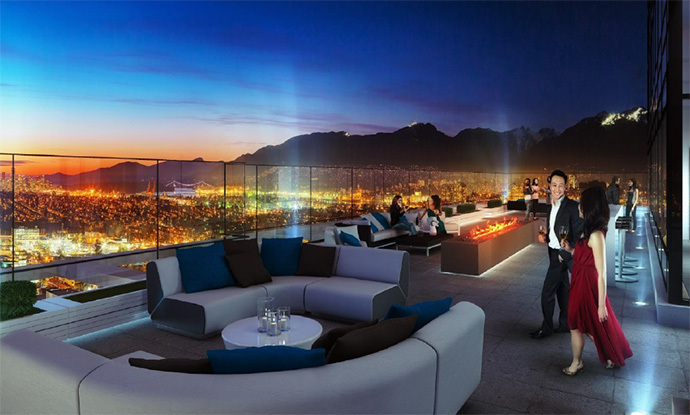 Firstly, CLUB 55 at ALTUS Burnaby high-rise tower will be the city’s highest rooftop patio, 55 storeys high! Here at the ALTUS Club 55 rooftop space, homeowners can enjoy over 5,000 square feet of amenity spaces that include a full kitchen for entertaining, large dining room for more formal affairs in addition to an outdoor lounge with BBQ pits and a fireplace (surrounded by comfortable seating). In addition the presales SOLO District Burnaby ALTUS Club 55 amenities include a poker table, pool table, table tennis and a media centre for big sports events and games. As well, Club 55 at ALTUS at SOLO District Phase 2 tower will introduce a full fitness centre the extends to an outdoor roof multi-sport court (for basketball and other things) and an outdoor rooftop garden (and professional landscaping too). The private amenities at the SOLO Burnaby ALTUS Club 55 amenity space will also include an outdoor terrace BBQ area with a wet bar and relaxing outdoor seating areas where you can entertain, relax or socialize with neighbours and friends. There is a landscaped roof green space and gardens too that feature environmentally considerate and drought resistant landscaping. In addition to CLUB 55 SOLO ALTUS Burnaby condos for sale also include a Whole Foods Market in the master planned community which is the world’s largest and most trusted source for organic and natural foods for healthy living. In addition, there will eventually be over 100,000 square foot of retail space right at your doorstep in the master planned SOLO District Burnaby Brentwood real estate Appia development. There are retail shops along the pedestrian friendly thoroughfares in addition to extensive landscaping throughout the many public gathering spaces in the family friendly and transit oriented neighbourhood. 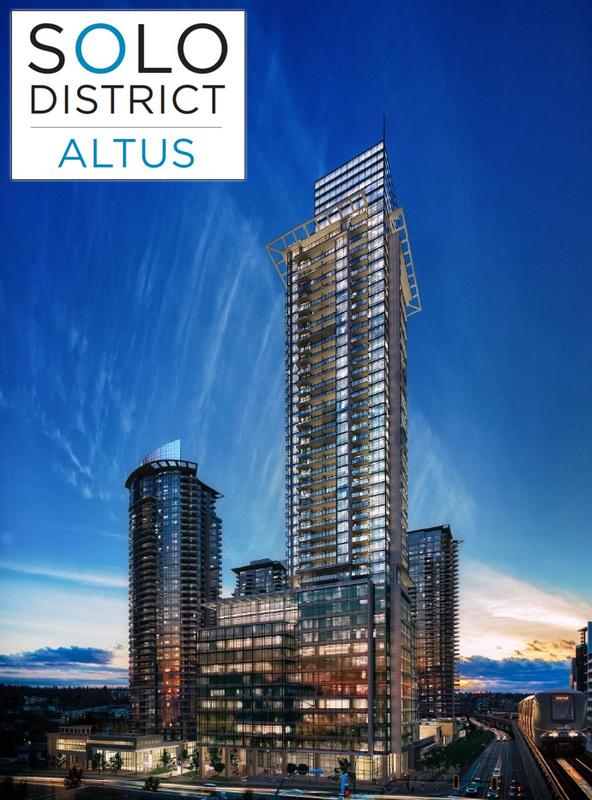 The preconstruction Burnaby ALTUS SOLO District condos will also feature a private concierge service for its residents in addition to three high speed elevators. Each home will come with a storage locker and Appia Development’s renowned access to their customer service team. The preconstruction Burnaby ALTUS SOLO District condos will also come with electric car charging stations and car wash bays in addition to a 1 year membership to Modo Car Share (there are 3 Modo cars available for ALTUS condo residents). Lastly, the homes come with geo-exchange systems, which means that you get year round heating and cooling through a central geothermal system which is very environmentally friendly. Again, the homes will be built to LEED Gold equivalent standards with geothermal heating and cooling standard in each residence. Also, the Burnaby Altus SOLO 2 condos for sale will come with interior design palettes by Cristina Oberti Design group (either Noce or Grigio colour schemes). Inside, the luxurious interiors of the Phase 2 SOLO District condos cannot be forgotten with imported and beautiful Italian Armony Cucine cabinets in both the bathrooms and kitchen in addition to beautiful laminate floors in the living/dining areas, kitchen, den and entryway. In addition, the Burnaby Altus SOLO 2 condos for sale will introduce over height seven foot entries and interior doors, soft close doors and drawers with under cabinet task lighting and custom roller blinds custom made for each home. The homes will also come standard with full sized stacked washer and dryer and modern/durable nylon carpets in the bedrooms. The kitchens and bathrooms at the preconstruction Burnaby Altus SOLO 2 condos will include polished quartz counters and the kitchens will have quartz slab backsplashes and an Energy Star rated stainless steel appliance package that includes Blomberg, Bosch and Fisher & Paykel brand name appliances. The kitchens will also have sleek Kohler pull-down faucets and contemporary Kohler modern rectangular undermount sink. The bathrooms at the preconstruction Burnaby Altus SOLO 2 condos for sale will come with large format porcelain tiled floors, wall tiling and low flow dual flush toilets with quiet close seats. Also available in the bathrooms are soothing and energy efficient low flow pressure balancing shower heads and enclosed glass shower in select ensuites. There are also luxurious soaker tubs in the masters. * Please note that all of the details surrounding the Club 55 SOLO 2 amenities and the Burnaby Altus condo features and floor plans are subject to change at any time. Please consult with your agent and the Altus sales staff for more details about changes to specifications and current promotions.